1879+ autograph album that belonged to a Mina, presumably of the Spring Creek, Pennsylvania, area. The seller of this album indicated that the owner was Ermina Reno, though I haven't been able to substantiate that. 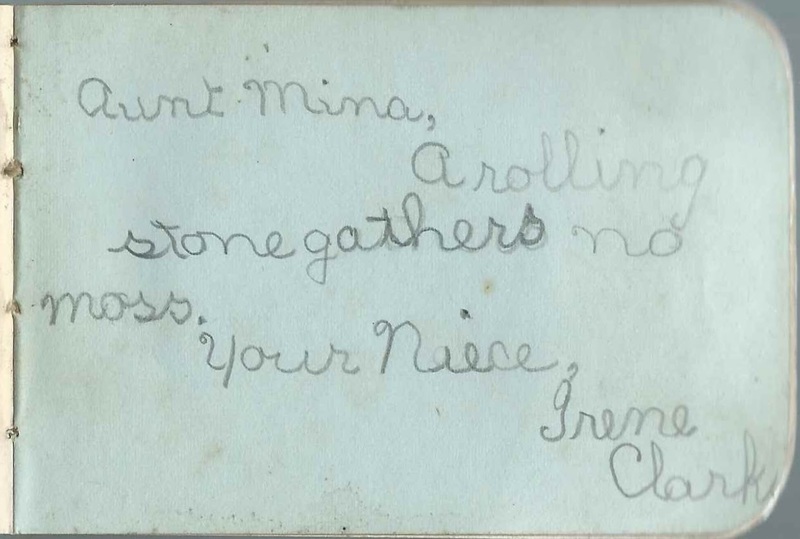 A clue to the album owner's identity: the page inscribed by Irene Clark, who described herself as Mina's niece. If you are able to establish Mina's identity on the clues provided in this post, please leave a comment or contact me directly. 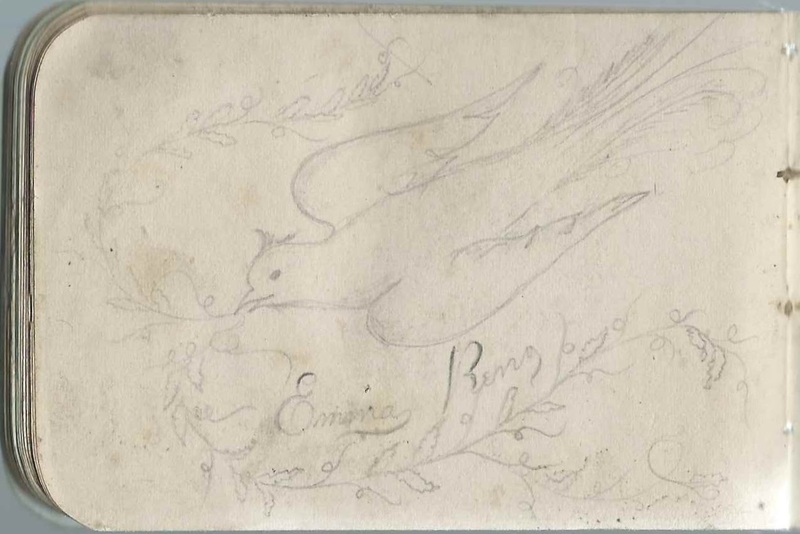 Two pages near the end of the album were decorated with sketches of a bird motif and were signed by someone with the surname Reno, with a first name that could be Ermina, Emina or Emma. If you recognize this person, please leave a comment or contact me directly. The album, which measures about 4" by 2-3/4" and is rather dilapidated, contains the sentiments of as many as 20 people. 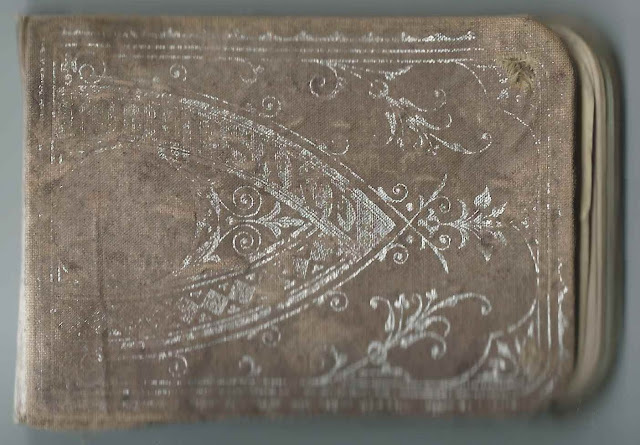 The exact figure is hard to determine, as some inscriptions are hard to decipher, some are unsigned and the two by Ermina Reno may have been done by someone other than the owner. It doesn't help that the inscriptions were made in pencil. Osmer S. Deming on July 23, 1880. Osmer Sage Deming, husband of inscriber Leona C. (Rigg) Deming. The inscription to the left was apparently written by someone else, perhaps a child. 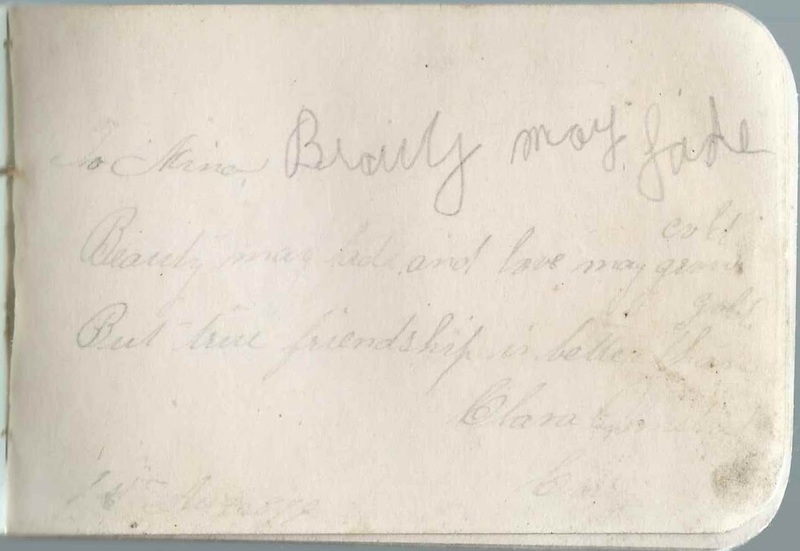 Clara Olmstead [surname faded out]; inscribed on August 1, 1879. 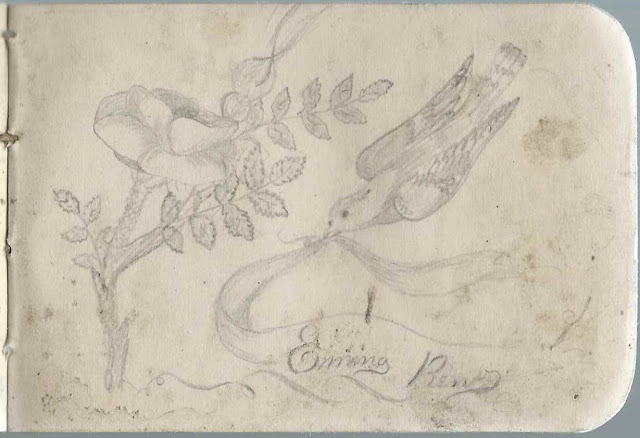 Presumably the Clara Olmstead of Spring Creek, Pennsylvania, who was married to inscriber Alfred H. Olmstead. Minnie Rose of Collinwood, Ohio; inscribed on April 18, 1879. Not sure if second name is a middle name or a surname.
? Davis of Spring, Pennsylvania, presumably Spring Creek, Pennsylvania. 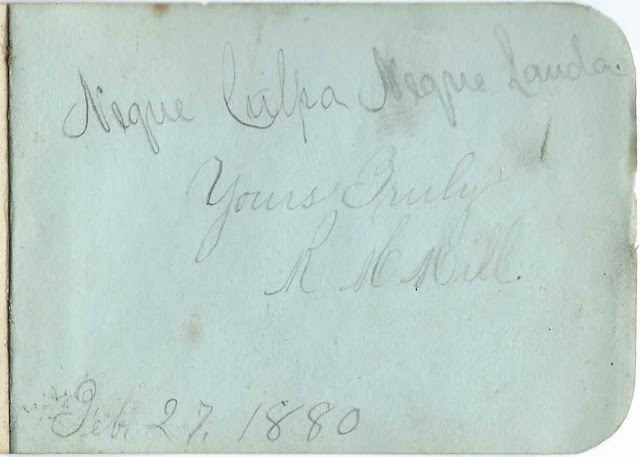 First and middle initials hard to decipher. A. G. Davis of Spring Creek, Pennsylvania, possibly Annie G. Davis. 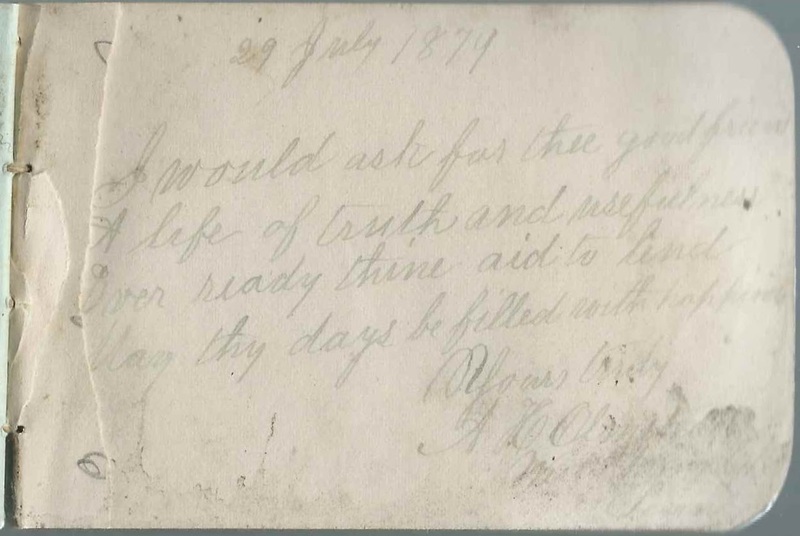 Osmer S. Deming on July 23, 1880. Osmer Sage Deming, husband of inscriber Leona C. (Rigg) Deming. Osmer inscribed facing pages, though the handwriting is different, as if someone much younger inscribed the left facing page. 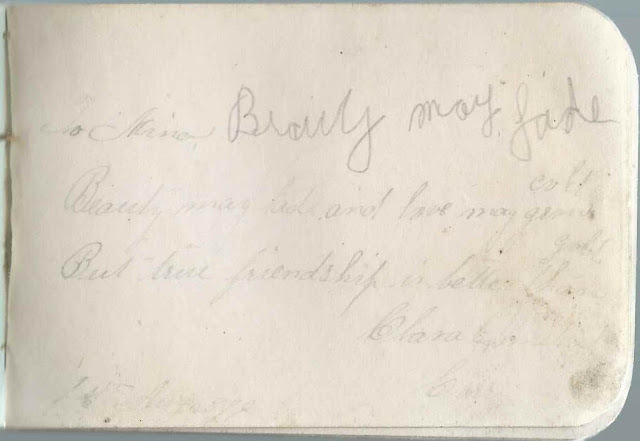 Clara Olmstead [surname faded out]; inscribed on August 1, 1879. Possibly the Clara Olmstead of Spring Creek, Pennsylvania, who was married to Alfred H. Olmstead.